That the New Orleans Saints are going through a post-championship hangover is probably the most predictable thing about this wild 2010 NFL season. That the Tampa Bay Bucs have a chance to grab first place in the NFC South about one-third into this season has to be one of the least predictable things. The defending Super Bowl champions head to Tampa this week to take on the upstart Bucs in what is, surprisingly, an important NFC South matchup. The Saints have been instilled as 4.5-point favorites for this contest, according to NFL odds, which kicks off at 1 p.m. on Sunday a Raymond James Stadium. This game is an opportunity for the Baby Bucs (3-1) to rock the defending division champions in the groin and open up an early two-game lead on New Orleans (3-2) for second place in the division. Atlanta is presently 4-1 and leads the South. The Falcons are on the road against Philadelphia on Sunday as well. So if all goes to plan the Bucs could actually find themselves tied for first place in the division. The Saints have been hearing the grumblings about their play get louder and louder over the last few weeks. “What wrong with this team?” “What’s going on with these guys?” “What happened to the champs?” New Orleans is yet to cover a spread this season and is coming off a goofy road loss at Arizona last week in which uncharacteristic turnovers and missed opportunities came back to kill them. Naturally there is a feeling in the Saints locker room that they can just step on the field and blow people away, as well as a “call us when the playoffs start” mentality of just wanting to endure the regular season. But after dropping two of their last three games and understanding that the Bucs are knocking on their front door I expect New Orleans’ talent to be a bit more focused and a little sharper this week. Tampa Bay is riding high and has to just be happy to be playing meaningful games again after serving as a piñata for much of the league last year. Last week the Bucs pulled an absolutely stunning comeback to beat the Bengals in Cincinnati. Tampa Bay was down seven with no timeouts and the Bengals had the ball with 2:28 to play. Two interceptions and some amazing receptions later the Bucs were up three with less than 10 seconds remaining. Much like the sudden rise of Kansas City, the early success of the Bucs is an incredible surprise. However, unlike the Chiefs I think that watching the film on Tampa Bay reveals that this team still has a long way to go before it can consistently compete with top-tier NFL teams. Tampa’s three wins this season are against Cleveland (1-4), Carolina (0-5) and the miracle win over Cincinnati (2-3). In their other “big game” this season they were pasted 38-13 at home by a Pittsburgh team that had Charlie Batch under center. Tampa has been outscored on the season (-6 in point differential) and outgained (-108 in total yards differential) by its opponents. Historically this has always been a tight series. Tampa Bay actually pulled a stunner in the last meeting, beating the eventual champions, 20-17, in overtime at New Orleans in Week 16. The Saints didn’t have a lot of motivation in that game. But they were still undefeated and they were still playing their starters when they lost in overtime to the hapless Bucs. Including that game, four of the last five meetings have been decided by four points or less and the underdog has covered five of the last eight. Naturally, the Saints are a road favorite in this contest. New Orleans opened at -4.5 and was quickly bet up to -5.0. However, there has been some pull back from the Bucs bettors and the number has settled back at -4.5 despite the fact that over 70 percent of the action is on the road team here. The total has dipped slightly from an open of 44.5 to a currently level of 43.5. Buccaneers are 2-6 ATS in their last 8 meetings in Tampa Bay. Underdog is 11-5 ATS in their last 16 meetings. Saints are 3-13 ATS in their last 16 vs. NFC. Saints are 1-5 ATS in their last 6 road games. 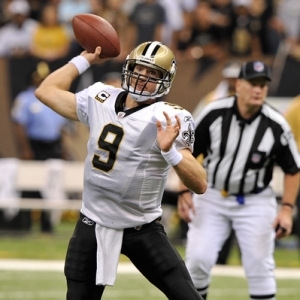 Saints are 0-5 ATS in their last 5 vs. NFC South. Buccaneers are 2-11 ATS in their last 13 home games. Buccaneers are 0-4 ATS in their last 4 games as a home underdog. Buccaneers are 5-2 ATS in their last 7 games overall. It’s too easy to sit here and say that the Saints are going to win big. And I’m not crazy enough to advise anyone to have their money on the Bucs. But the more I look at the numbers the more I do think that the ‘over’ is the way to go in this one. The ‘over’ is 20-8 when the Saints are a road favorite and the ‘over’ is 6-3 in the last nine meetings between these clubs. We have two big-armed quarterbacks rolling in this one and neither team has been able to run the ball at all this season. More passes means more big plays and, perhaps more importantly, more clock stoppages for incompletions. The Saints offense hasn’t topped 24 points all season and you have to think that they are due for a breakout game. On top of that, the Bucs are actually 0-6 against the total in their last six divisional games (and 2-9 against the total overall). I think that an improving offense, fueled by the home crowd, will help them get enough juice in this one to top that total. I like the Saints, 30-17. And one final betting note: The team that has won this game has covered eight of the last 10 times, so if you believe that the Bucs can hang around it may be worth hitting the moneyline on them as well.